It isn't ceremoniously springtime until the "sugar ants" make their appearance. They're back! It's definitely spring here in the Northeast! We've begun the relentless pursuit of starving them out - no offense little fellas. Keeping the counter tops and the sink clean, maintaining a tight lid on the compost bucket (tight lids on everything, this is war!) and basically, enduring their onslaught of tiny, marching bodies until they tire of us and move on (can't come soon enough for my liking!). But... this post isn't about marching ants (hurrah, hurrah), however, it is in direct correlation with the animal kingdom, more specifically, Disney's Animal Kingdom!! 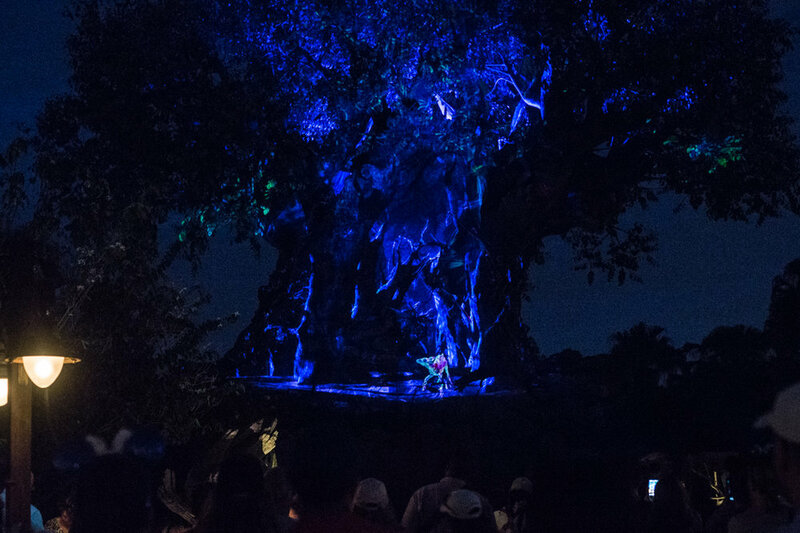 Nineteen years ago, on Earth Day, Disney World opened their park doors at Animal Kingdom with a clear mission in mind: celebrate the animal world and bring about conservation efforts and education. 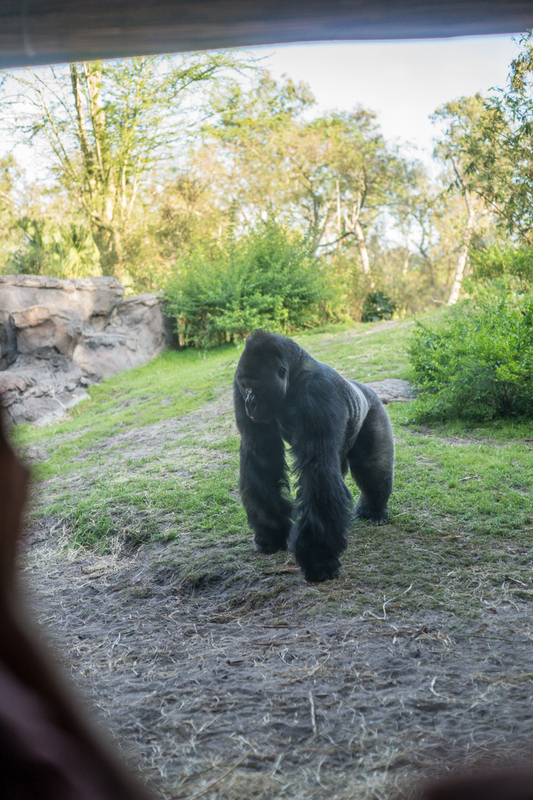 It's been their steadfast goal and I was surprised to learn that since 1995, the Disney Wildlife Conservation Fund has devoted more than $6 million to conservation efforts around the world and has supported more than 230 projects. Wow, incredible work they are furthering and digging into. Well done, Disney!! 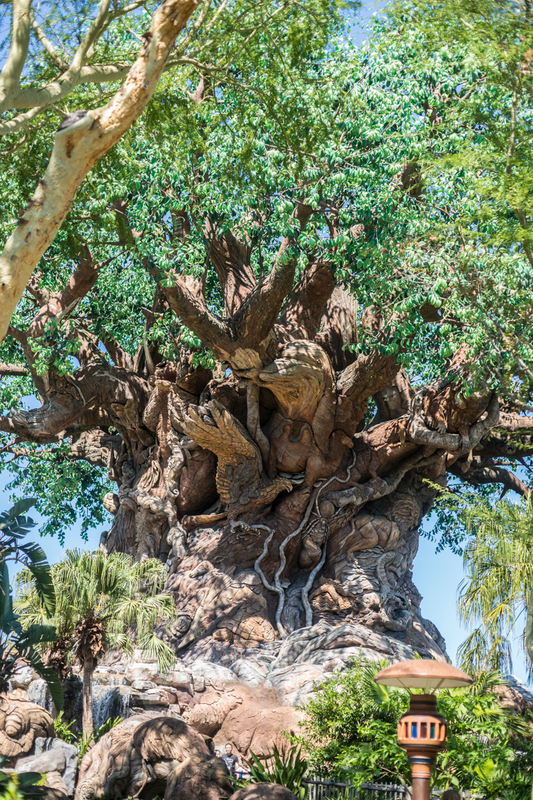 Upon entering the park, the grand focal point and welcoming exhibit is The Tree of Life. Standing 14 stories high, with over 300 creatures from the animal kingdom exquisitely carved into the trunk, and 50 feet wide, it is awe-inspiring, reminding us how small, vulnerable we all are, yet how beautifully majestic our world is, and that we should never take it for granted. Our first stop was It's Tough to be a Bug! situated beneath the Tree of Life. This is a cute, interactive, educationally fun show featuring the character, Flick (an eternally optimistic ant from Disney's movie A Bug's Life). I was not able to get any images within this theater as the screen is not photogenic, plus I was too busy covering up my lens when water was spraying over us! It's a must see - the kids all loved it! Our next stop was completely by accident, an unplanned delight. We took a wrong turn as we meandered through Asia, hearing applause, our curiosity took hold, we peeked in. We were in search of a cool spot to sit before our next FastPass so we had time. We watched the stage show, Flights of Wonder, with exotic, colorful birds that would fly on command. Really neat! Then it was time for face painting! 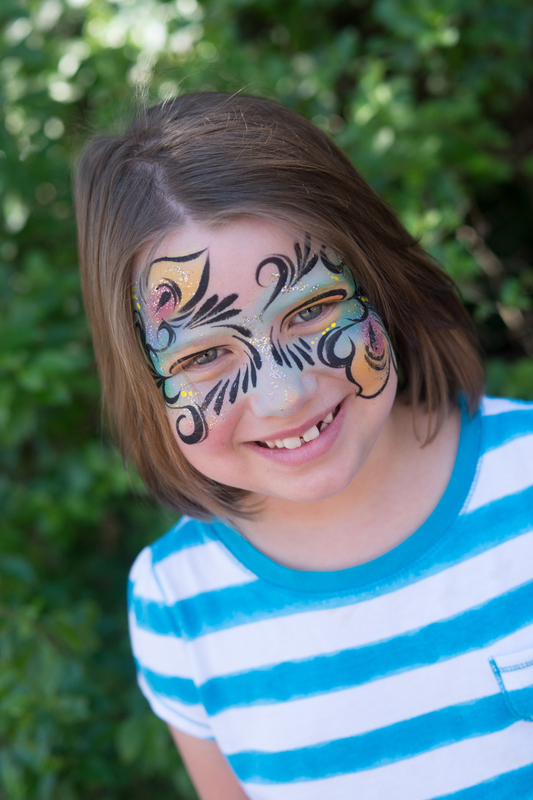 Alanna remembered having her face painted here when we last visited with an entire crew of family members. Pleasantly, we found what she was looking for in Harambe, Africa!! Finding Nemo - the Musical, was another delightful performance and a treat to experience. They've perfected the stage presence for this one! It moves along at a good pace to keep all ages entertained and tuned in, eagerly anticipating the story line and leaves you wanting more! 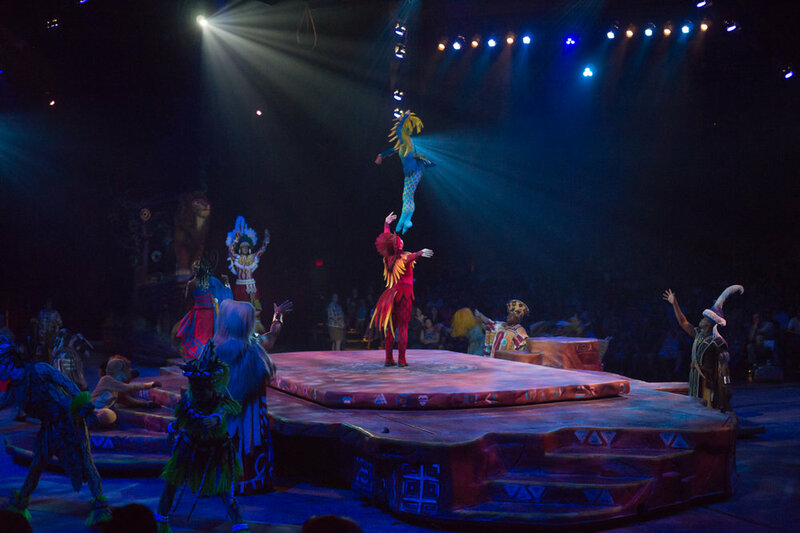 Speaking of wanting more, the Festival of the Lion King show was a vibrant array of characters, exuberant dancing, all the songs we know and love, and agile acrobatics! They ask for young members from the audience to participate and dance in the show towards the end (head's up!). Our girls were too shy for it, but there were lots of others that weren't as shy! The round-tent-like show was a phenomenal performance that had us singing, clapping along and ear-to-ear smiling!! It's another must-see! I added in a clip of the Circle of Life finale for you to enjoy (be warned, you may be inclined to sing along!!). 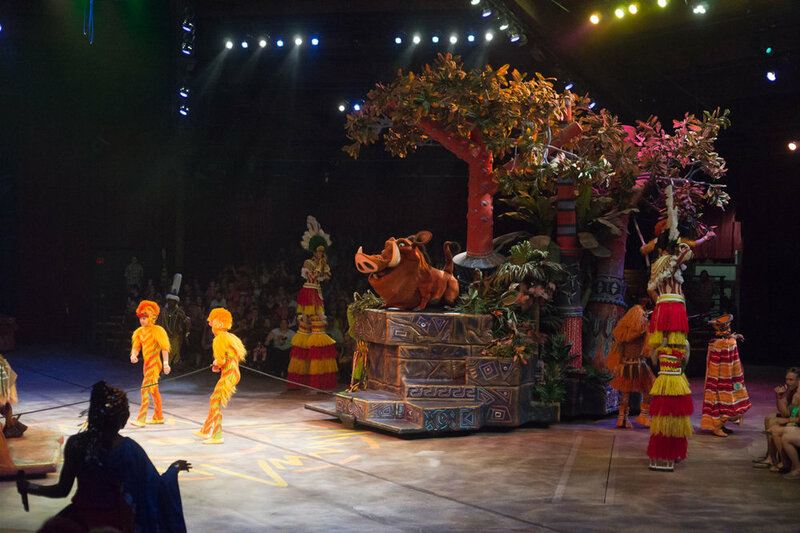 After the amazing Festival of the Lion King show, we were ready for a slower pace and more animals! Kilimanjaro Safari is a wildlife adventure. 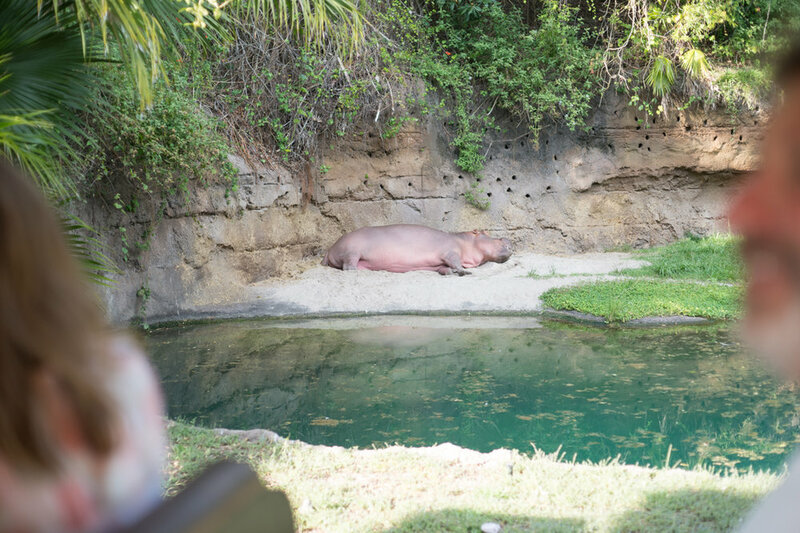 We thought that either early morning or later afternoon would be best to view the animals since they might be more active at those times of day. We did see a lot of amazing animals, but we may have had better luck in seeing more activity a bit later. Still, it was great! And the girls loved (loved!!) witnessing the animals in their natural habitat. It was another treat! 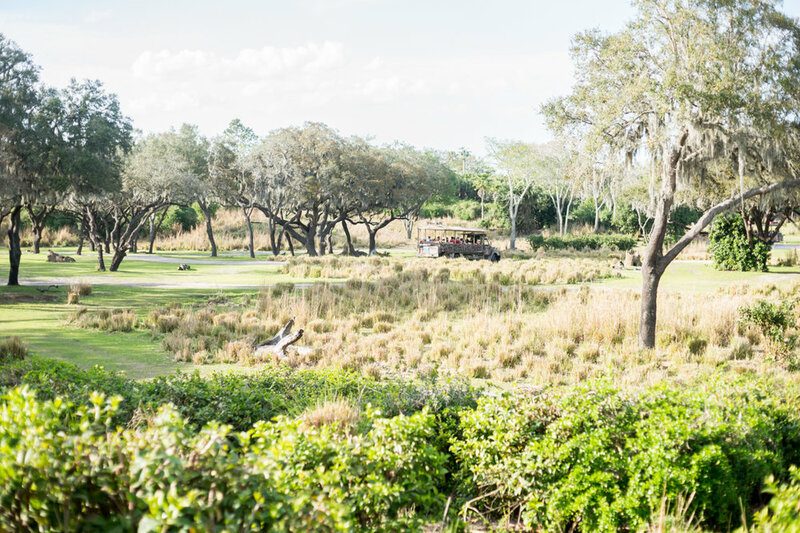 Interestingly, the "110-acre Harambe Wildlife Reserve is a spectacular sanctuary dedicated to the protection of African animals" that keeps you wanting more! See if you can spot the furry head of a daddy lion sunning himself, napping in the eighth image below with the boulders. Once you see him, you can't unsee him! And then there was the silverback Gorilla that made his presence known. After dinner, with full, satisfied bellies we were all set to head back to our resort for a night swim and pack up to head home in the morning. On our way, we noticed another spectacular show happening. 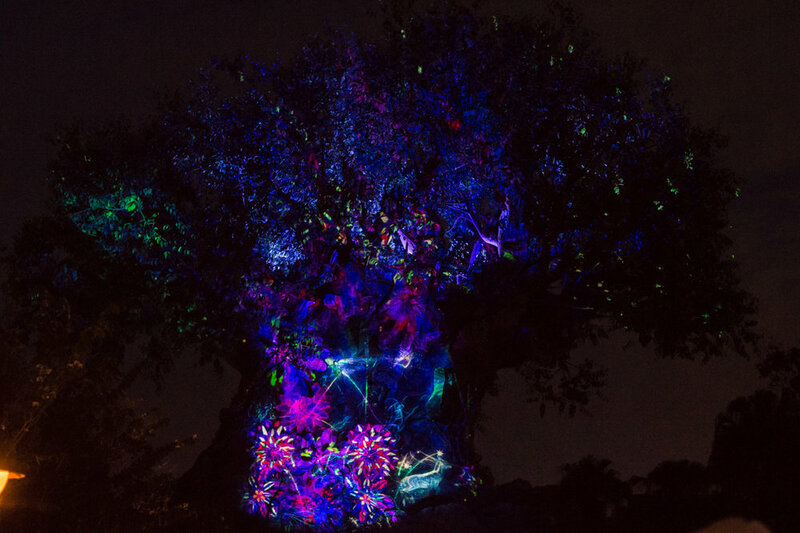 The Tree of Life Awakenings, a gorgeously colored light show set to music. The animation jumps off the tree and we were all mesmerized. The story unfolding is centered on a young doe. "A feast for the eyes, each revelation celebrates the eternal balance and harmony that exists in all living things, big or small, and is sure to inspire and delight the entire family, big and small." Truly magnificent! And with that, our Florida vacation is a wrap. I hope you enjoyed hearing about our adventures and viewing my images. I shot most all of these on my Sony a99 with a 50mm f/1.4 lens since that was lighter for me to carry, however, some of the images were shot on my iPhone. You may be able to tell the difference. ;) We all had a marvelous, whirlwind vacation together! We loved every minute of a every adventure... the girls didn't want it to end. You might tell by the unenthusiastic faces on the flight home. Thank you, Disney. We are grateful to you. We were up bright and early for a full day of delights at Disneyworld's Magic Kingdom. Just in time to have breakfast with the princesses at Cinderella's castle! Something we hadn't done before and we were all pleasantly surprised at how elegant it was. The food was exceptional, just about everywhere we dined that was the case. We opted not to do the meal plan with our package. There wasn't any way on earth we could eat that much dough ($$$)!! Our daily routine was simple: eat a healthy, hearty breakfast; have ice cream for lunch (yay! ); and then a well balanced, delicious dinner, also drinking plenty of water throughout the day to keep us hydrated! It worked great for us! The music playing through the park inspired the girls to dance! Notice their matching berets they had chosen the night before from Epcot's France. All of the princesses were very warm and personable, however, these two exceptional ladies made an extra special impression on us. Thank you, Princesses Snow White and Jasmine! There was a small window of time before we were off to our first Fast Pass entry. The parks were packed and we were extremely thankful to have scheduled up to 3 Fast Passes per day. The carousel is always a favorite and not much of a wait - bonus!! I have made it a point to ride this particular colorful, cheery ride each time I've visited the Magic Kingdom. I was about 9 the first time I experienced "It's a Small World" and I can tell you it hasn't changed much, if at all, over the past many decades since then! It is the happiest cruise that ever sailed! We had time after It's a Small World before our next scheduled Fast Pass, so we decided to try out Peter Pan's Flight. We waited for an hour inching along in line. The waiting area is designed to delight young and old alike, and we enjoyed all the magical treats along the way, including making friends with the young family behind us, chasing shadows, having pixie dust sprinkled on our heads and Emilia's loose tooth that managed to come free!! (yes, the tooth fairy found us on our vacation - isn't she something else?!) However, the ride itself was a bit of a disappointment. I suppose if we hadn't waited so long for it, we wouldn't have built up such high expectations. As the girls disembarked from the ride, they turned and said to us, "That was it?!" Sorry, this ride fell flat for us. A ride that is a complete treat and hasn't ever fallen flat for us was the Jungle Cruise! A guide with a quirky sense of humor lead us through the exotic and exciting rivers across Asia, Africa and South America. So many of her jokes warranted a punch line drum sound effect to exclaim "Okay, laugh people!" Ha!! :) It was great fun and our guide was a good sport! We found some muppets putting on a show from the windows of the Hall of Presidents! All hail the Muppets!! This quartet with whistles were quite talented! They kept me and a small crowd happily entertained while Kurt took the girls into Mickey's Firehouse on Main Street to pick up their Sorcerers of the Magic Kingdom spell cards. A quest game and a scavenger hunt that the girls played after dinner. We took an afternoon hiatus and went back to our hotel to rest before then heading back for our dinner reservations at Be Our Guest. Yay!! We were worried we might miss the Beast while dining in his castle, but ... we didn't worry for long! After our amazing, scrumptious, lick-the-plate-clean (okay, no, I didn't actually do that, but the meal was that good that I may have if dared!) dinner, we walked around the different rooms to view all the intricate details and I could post 10 more photos right here, but I don't want anyone falling asleep through this blog post!! You'll just have to go visit this amazing restaurant for yourself (but be sure to get your reservations in early because they were booked solid). After dinner, the girls were on a magical mission! A quest to defeat the evil Hades using their spell cards and magical powers! This was a neat, interactive scavenger hunt and we were all caught up in the fun quickly! It was another successful day full of laughter, surprises, magic and amazement!! The Magic Kingdom is timeless for me, a place where time seems to stand still - a magical portal to childhood. Our girls had a thrilling, happy day and Kurt and I did too! Disneyworld is the happiest place on earth! The staff at Disney, even the lifeguard at our hotel pool who gave us tips and advice, are all top notch folks that seemingly feel honored to be a part of the Disney experience. Every single person (every one!) we met on our travels were all wonderful, ready-to-please, ready-to-help, on-the-ball and on their game!! Truly, the rides are fun, captivating, but the people behind the gates, the costumes, the masks, at each turn, employed by Disney are what make Disneyworld even more meaningful and special. Thanks, Disney for another spectacular day!!! We loved making memories with you!! The first twenty years are in our "The Story of Us" book and we are now onto our next twenty, or more with a stroke of luck and a prayer! Kurt and I have built a life together, and if I told you it was easy, I'd most certainly be lying. Our life has had many setbacks, disappointments, struggles - deeply personal ones that we've had to work through. That's the great thing about marriage though! Once you work through the messy stuff together and you come out the other end, you can high-five one another, and say, "Hey! Look! We made it!" It strengthens the marriage bond. People will always tell you how hard marriage is, that it takes constant effort, constant attention, constant compromise, and a constant, everyday devotion to one another. I absolutely would agree with that. But... I'd also add laughter and fun. Each day it's important to make one another laugh. I think that's what my guy and I have perfected. He can make me laugh like nobody else, and I'd say it goes both ways. We know how to laugh through life's ups and downs. So, when we knew this monumental occasion was coming up and being that our young girls are at a perfect age to enjoy Disneyworld, well, the plan unfolded. I mean, what better way to celebrate your 20th wedding anniversary than at the happiest place on earth?! We started the Orlando segment of our vacation at Epcot complete with amazing rides, aquarium enchantment, beautiful flower garden festival and dinner in France! Oui, oui!! A favorite ride at Epcot includes Spaceship Earth - with a journey through time highlighting how story-telling has evolved and helped to form our culture, our very existence. It's quite astounding to think we have evolved as a human species from documenting our lives on cave walls to now -- blogging with internet connections around the globe in a matter of seconds. umm... wow. I wonder what the future will bring for our grandchildren. Another favorite ride of ours was Soarin.' I couldn't get any photos on that one, but if you get an opportunity to visit Epcot, do yourself a favor and take the Soarin' experience!! Really neat!! It was like flying through the world: great mountain tops to lush valleys to castles in the sky to polar bears roaming the arctic!! Truly magical. The Seas with Nemo & Friends was our girls most favorite! (funny, I think it was Alanna's favorite the last time we visited - she was 3). It is a sweet ride that tells the Nemo story. Afterwards, there's a terrific aquarium (tanks full of all sorts of fish, some manatees, dolphins, sea turtles, and more!) to tickle your sea-loving spirit. The dolphins put on a show for us! We loved it! We made dinner reservations at Les Chefs de France months ago - thankfully! The lines were long and if you didn't have a reservation, you weren't getting a table. We were ready for dinner made to French expertise. And the desserts!! Heaven. Pure heaven. The food was delicious and the service was très chic! I asked our server many questions just so I could hear her beautiful French accent. :) The evening was divine. Afterwards, there were fireworks over the tree line that we caught glimpses of, and purchases of french berets and tiny Eiffel towers. We had a super early morning the next day so we made our way to our hotel to settle in for the night. All in all, a marvelous, magical day for an anniversary. Thanks so much for stopping by to view my Epcot images and hearing about our day's events. I'd love to hear from you. Have you visited Epcot? What was your favorite ride? Do you have any marital advice for my guy and I? And if you are married, how many years for you? I'm thinking a cruise for our 25th! ;) Thanks again, friends! And Cheers to all the happily married couples out there making magic happen through the years! Keep on high-fiving each other!! xoxo L'amour est le plus grand!